As of writing this there’s currently an almost 40% disparity between the critics and audience’s response to the latest Star Wars on Rotten Tomatoes. For all of the high moments, satisfying pay-offs, and generally cool Star Wars stuff, a movie that runs two hours and 33 minutes is bound to fall flat in some areas. With The Last Jedi, these areas happen to have a lot in common with some of the worst aspects of video games. If you haven’t seen Star Wars VIII yet turn back now. There are spoilers ahead because honestly it’s almost impossible to talk about this movie without getting into specifics and Star Wars fandom being what it is, just about every specific thing in the new movie could be considered a SPOILER. Anyway, you’ve been warned and all that. This is a post about the middle act of the new movie. The one where Rey and Kylo confront one another through a Force connection despite being light years apart in some of the best dialogue The Last Jedi has to offer. And the one where Finn and Rose go off on a wild goose chase because the movie needed something for them to do. It’s something I’ve done plenty of times in video games. If I tried to compile a list of all the mundane, nonsensical, or ultimately unimportant missions I’ve completed in them we’d be here well into the new year. Increasingly this type of stuff is finding its way into bloated blockbuster movies like Star Wars. It turns out that the First Order can track ships through hyperspace because of a breaking edge technology that fundamentally upends the logic of the entire series. 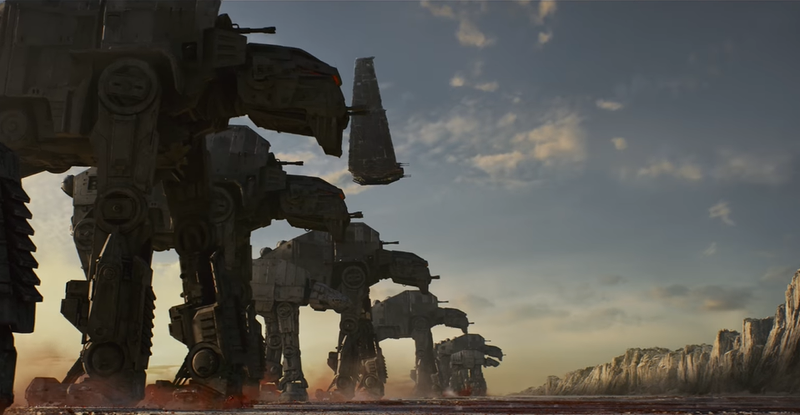 In a sprawling galaxy where an entire rebellion has existed for generations simply because ships can pop from one place to the next in the blink of an eye, The Last Jedi introduces magical GPS tracking that essentially makes guerrilla-style warfare impossible. More importantly, it’s the rationale behind why Finn and Rose fly off to a random planet modeled off of Monaco so they can disable the technology. This is something the movie does repeatedly, creating problems that didn’t exist before just so its characters can pull off blockbuster high jinks in pursuit of their solutions. In effect, a large chunk of The Last Jedi sees Leia put out of commission so that the other principal characters are kept in the dark about what her trump card is thus leading them to cook up their own half-assed plan to jump into hyperspace but without the enemy fleet following them which requires rewiring the space GPS on the big boss’s ship which in turn means they have to find a “code breaker” who can get them on board without being noticed which in turns means going to a casino where Rose can recount her backstory, motivation, and maybe use both of them to get Finn woke. All this and I haven’t even explained the parenthetical subplots that take place on this casino world because that would take too much time to describe such short parts of the movie that aren’t very memorable anyway. (We’ll also bracket the fact that The Last Jedi managed to make space casinos boring and soulless. What could have been the new trilogy’s Mos Eisley Cantina was instead set dressing for some extremely brief Marx Brothers-style gags). Had Leia not been forced into a coma by the writers, or had her second-in-command, Vice Admiral Holdo (because Admiral Ackbar is dead, in case you somehow missed that split second, off-screen send-off, RIP) deigned to share them with the rest of the crew, Finn and Rose would have known all of this was completely unnecessary. In fact, it would have potentially saved hundreds (thousands?) of lives as Benicio Del Toro, the reward for their sidequest, wouldn’t have been in a position to tell the First Order about the escaping transport vessels Leia had bet the house on all along. And yet despite all of this, the good people still end up on the red salt mine planet and the bad people still chase them there resulting in a final showdown that could have happened half way through the movie since all the stuff that happened in-between turned out to be completely beside the point. It’s almost as if the movie could have spent that hour and a half letting Finn and Rose clean the lower decks of the Rebel Alliance cruiser together and contemplate life, politics, and what kind of world they want to build after the war in scenes that lasted more than a few minutes and didn’t involve the camera cutting every three seconds. Some of the best parts of The Last Jedi are character-based. Whether its seeing Luke Skywalker grudgingly try to teach Rey about the force or Kylo Ren steal the show in just about any scene he’s in, almost every moment where the movie’s cast gets a chance to interact and play-off or against audience expectations works. (Luke curmudgeoningly guzzling milk from whatever-you-call-it on his island of exile marks a high point). Star Wars in general is also pretty good at creating beautiful, fantastical places where space battles, lightsaber fights, or other sweet scifi stuff can happen. When it comes to cooking up rationales for why the characters need to get from one dramatic set piece to the next it usually takes a straightforward approach—find the person, get the thing, go to the place, destroy the thing with the other thing. The Last Jedi, on the other hand, tries to take that pattern and fold in three or four other branching plot lines but knowing all along it can’t actually pursue them naturally or let them have actual consequences because it’s only one movie god dammit and sooner or later every important person needs to show up unscathed to the final dramatic climax. Video game stories tend to do poorly in this area as well. They have cool (B.J. Blazkowicz), interesting (Ellie), or charmingly iconic characters (Mario) and game rules that keep the player busy solving interesting problems and experimenting in new ways. When it comes to the “why” behind this stuff though, video games almost always fall flat on their faces. Even games that take place within interesting worlds over all, like Gears of War or Horizon Zero Dawn, often struggle when it comes to the reasons why you do the stuff the game wants you to do. This is why so many missions in games revolve around going to a place and killing/destroying/disabling the super special thing that’s there. On its own this can be satisfactory enough. These are video games after all, even the thinnest of plots can help paper over that little voice in the back of our heads screaming “Why does any of this matter?? ?” I, like a lot of people, have sunk hundreds of hours into Destiny after all. Gears of War: Judgement is full of objectives, the completion of which never amounts to much. Where this kind of slipshod plotting becomes especially mind-numbing, however, is when a game gets lazy and tries to extend things even longer by pulling the rug out from under whatever objective was just completed. You finally got to the power plant to recharge that battery to power your ship so you can get back to the base to warn your friends about the enemy plans? Awesome! But FYI the bad dudes just blew up your ship so now you have go travel somewhere completely different and shoot a whole bunch of other things. It’s not just bad storytelling, it completely kills the vibe. Being reminded that all the made-up stuff you do in video games doesn’t matter is one thing, but having to do a bunch of that made-up stuff all over again, just in a slightly different sequence with a few palette swaps and slightly tougher enemies can be soul crushing. Let me tell you a quick story about Gears of War: Judgment. Like a lot of games, when you actually try to breakdown what the story is and explain to another human being all the things you’re running around to do, it can get overwhelming, despite being, for all intents and purpose, an elaborate splatter gallery for this really cool gun that has a chainsaw connected to it. In Judgement the heavy is the Locust (read: bug people) General Karn. You spend the game trying to kill him, despite orders from your superiors to the contrary (sound familiar?) but in order to do that you need to get your hands on a missile, and in order to do that you need to get the codes to it and also this robot that helps target it and then actually get to the launch pad and all the while there are hordes of these bug people attacking you. It’s a mess but it’s a fun mess because shooting and/or chainsawing bug people and all of the maneuvering and problem solving that goes into that has a surprising number of interesting and thrilling layers to it. Finally, hours of slaughter later, you get all the stuff for the missile and fire it off at Karn making him go boom. It feels good. All of that chainsawing and perfectly-timed reloading paid off. At least until later on when you find out he survived, because in classic video game fashion there needs to be a final boss, even if that means resurrecting the one you already had the player off at the end of the second act. Moments like these are deflating because they expose the artifice of the world you’ve tried to immerse yourself in, like being woken from a particularly enjoyable dream in the morning by a car alarm outside and being unable to fall back asleep and find it again. Video games have an excuse though. At the end of the day we play them because they’re fun, have interesting systems to mess around with, or we just enjoy existing, however breifly, in whatever weird world they’ve got locked inside. It’s harder to be that kind of willing accomplice as a passive viewer though. The Last Jedi’s casino world is fun to look at for a bit and watching Finn and Captain Phasma try to bash each other into the ground with faux-lightsabers is cool when it finally happens even if it’s just there to help sell more action figures. But like whatever snack you were popping into your mouth while watching these parts, the satisfaction they grant doesn’t last beyond their time on screen. They don’t have anything to do with the larger story and in the end don’t result in any meaningful epiphany for the characters involved in them (for all of Rose’s talk about slaves and the revelation that the Alliance buys armaments from corrupt oligarchs, I don’t think either will be agitating for a workers’ revolution any time soon).